Okay fine, the intro copy was not a hundred per cent accurate. 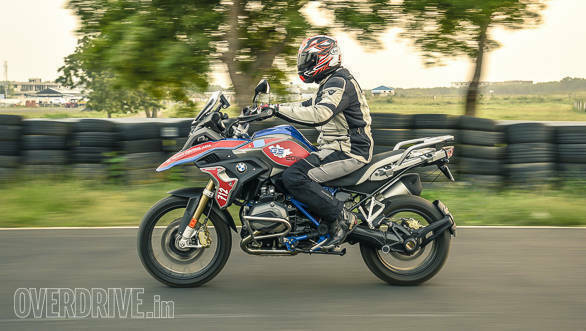 It was our first chance to ride a proper BMW R 1200 GS testbike so it isn't like were going to ever say no, right? Then I spotted the blue frame. Is that...? 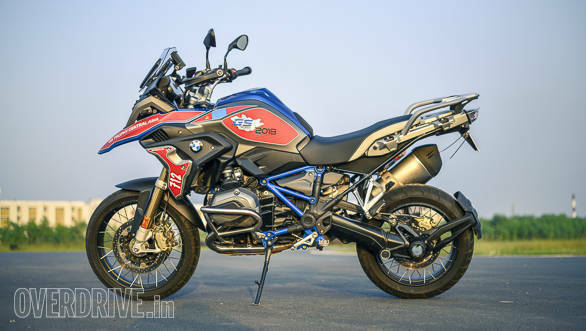 Yes, BMW Motorrad confirmed that this was indeed, a 2017 BMW R 1200 GS Rallye model, an off-road oriented model that sits between the basic GS and the hardercore GS Adventure. What options did you tick? Turns out, this was Tomm Wolf, the GS Trophy instructor's bike. So apart from the stickering, this motorcycle is a basic Rallye with Sport (semi-active) Suspension from the GS Adventure added. 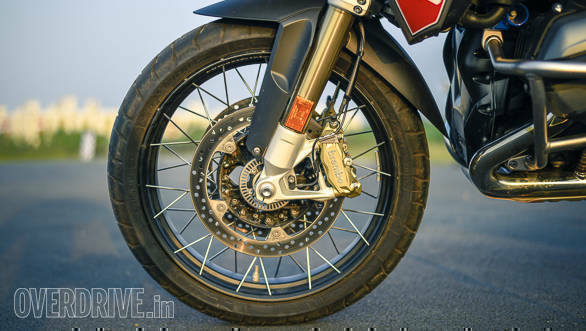 This increases off-road ability and raises the motorcycle 20mm. I never thought 2cm was going to be the end of the world. But it nearly, nearly was. Here's how things happened. 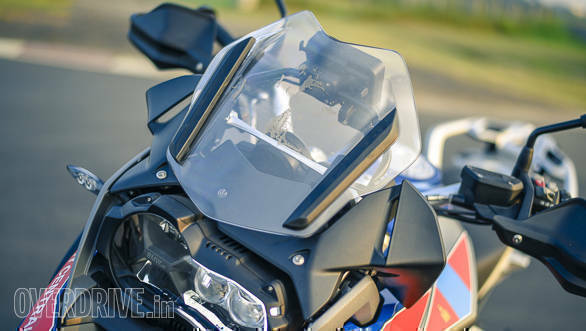 The BMW R 1200 GS Rallye looks complex with its multiple tubes, surfaces, edges and planes. BMWs are super electronicked nowadays and we hit our first snag when one of our riders went to a gas station and couldn't open the gas tank cap. Er. That's the end of the story folks, have a good one, bye! Or not, we eventually figured it out - there's a sequence of ignition button and key cover flap operation to unlock the cap - and then the riding could begin. And that brought a problem. The Rallye manfully resisted all attempts at casual selfies because no one could just climb into the saddle. It was hilarious! The suspension makes the Rallye a very tall bike and climbing on, even for 6-foot me had to grab the front brake and climb the left peg and then swing my right leg over, full adv or dirt bike style. Immediately, you notice the short screen and the commanding riding position. And the fact that my toes just about reached the ground. 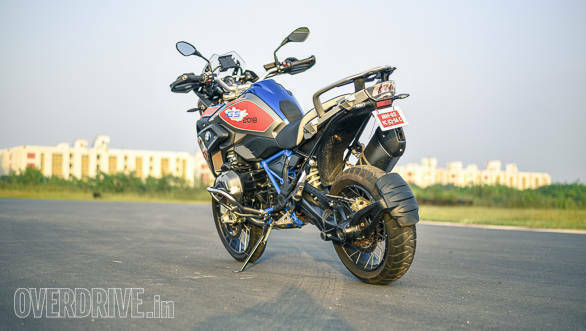 I suspect that the stock Rallye and the base GS models will be far easier to ride for normal people, though. And then I noticed the torque. The GS seems to be able to hit peak torque right off idle. This was initially a bit scary and then a lot of fun. 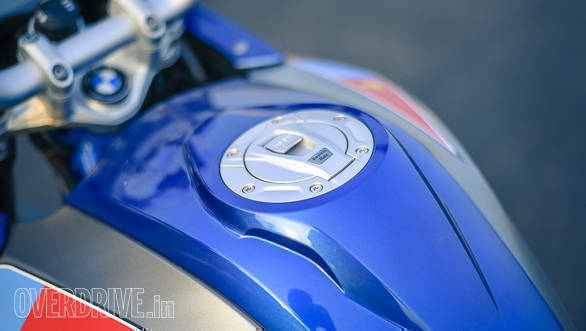 A big, fat, luscious dollop of torque arrives as soon as you release the clutch and it makes centering the considerable mass of the GS rather easy despite its size. I soon found the confidence to make tight U-turns with my feet up as well as slow speed turns on loose surfaces inside of the tarmac portion of the MMRT. But it's a lot of torque. 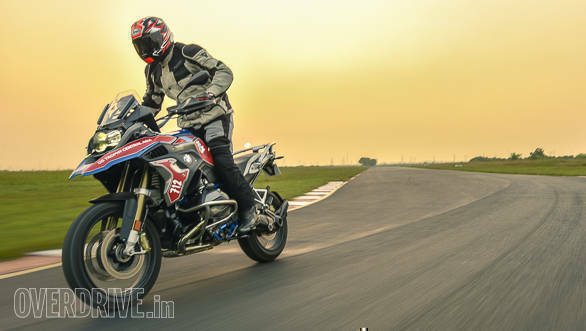 Which combines with the insanely absorbent suspension on the GS to produce startling speed on bumpy and loose as well as good tarmac surfaces. For reference, this bike was wearing Michelin Anakee Wild tyres - which are on-off pattern, but the Rallye can be purchased with knobby pattern tyres at no extra cost. But what I remember most from my previous ride on a GS a few years ago was how at peace it felt at cruising speed. This has not changed. 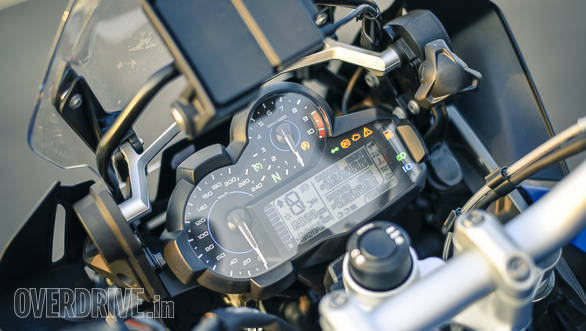 Settle in to anything from 100 to 140kmph and the GS quietens, calms down and settles in for the long haul. It's a spookily serene state that every long-distance rider will love. 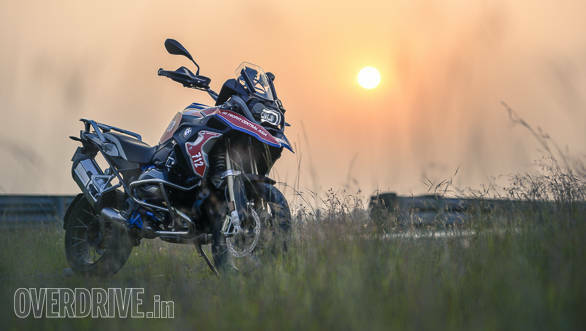 Indeed, just about two years ago, a friend rode a GS from Delhi to Mumbai in one long stint. You crazy? I asked him out of concern (and amazement). He simply said, "No man, everytime I thought I should stop, I felt so fresh that I felt like going another 200km and then thinking about stopping." And next thing he knew, he was 200km from Mumbai so why stop, right? It really is. There's no escaping the sense of size and mass when you see the motorcycle for the first time. This particular GS comes with standard cylinder head guards and stuff but most owners will add a lot more, er, plumbing to the motorcycle and then add a forest of lights as well. All that makes the motorcycle look very, very large indeed. 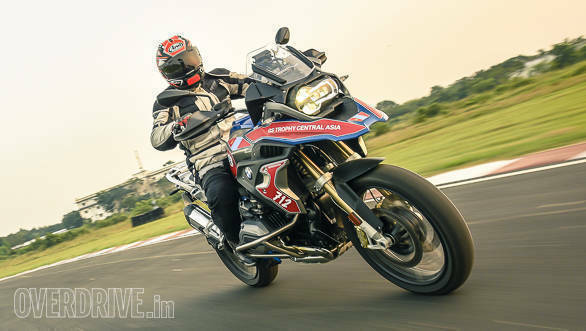 The size is not in sync with how easy it is to ride but I am sure BMW Motorrad has to convince more than a few small statured riders every so often that the GS is actually a very easy machine to ride. 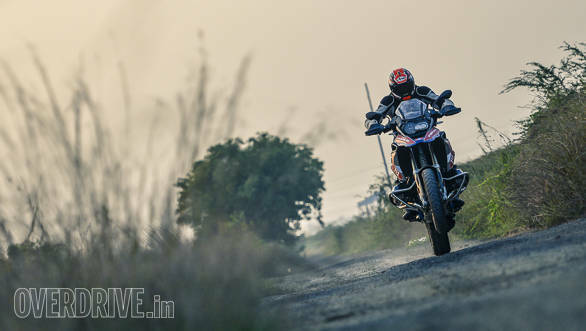 The GS has a unique suspension setup, a very traditional setup as far as this motorcycle is concerned. The rear is the latest generation of the BMW Paralever - a parallelogram style shaft drive arrangement that maintains chassis attitude when you get on the power. The front is a BMW Telelever which uses hard stanchions that have no travel but connect to a 'wishbone' that operates a spring strut you can see under the beak, between the stanchions. You can also get the optional Electronic Suspension Adjustment or semi-active suspension. But it doesn't work like normal suspension. On one of our tracks, there was a trench dug across. 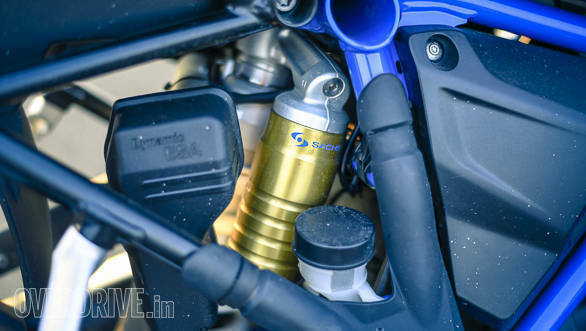 Here, the GS would feel weird because the suspension would do its job without the GS dipping or pitching as you expect telescopic fork-ed bikes to do. The same behaviour is also seen in minor or no dive on the brakes and a stable attitude in the corners. It takes a moment to get used to but after a while feels completely natural. And what you notice then is how supple and absorbent the GS feels on almost all surfaces. Unfortunately, this was a very short ride and we didn't have the time to go through the menus and figure out how the GS changes in feel as you tune the suspension to your liking - that has to be a story for another day. 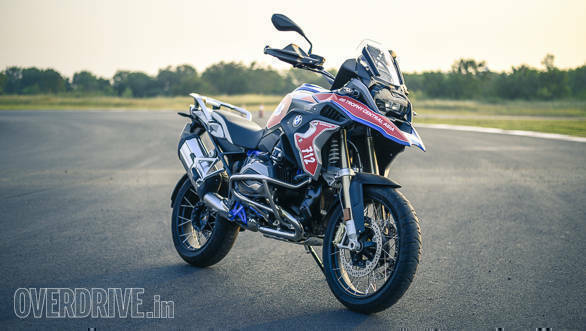 The BMW R 1200 GS Rallye Pro with Passenger Kit is priced at `20.55 lakh ex-showroom and comes to nearly Rs 26 lakh on-road Mumbai. The GSA suspension is a Tomm Wolf specific extra. Which is not an insubstantial sum of money, right? The quality of the materials you see is very, very high and there's no doubt that you're buying a premium German machine but a casual purchase the BMW cannot be. Also remember that just like BMWs cars, the GS comes with an options list as long as your and my arms combined and the more options you tick, the higher that price goes. Strangely enough, this doesn't seem to affect its appeal for me, just seems to make my bank manager more squirmy than usual.